Description (Goodreads):- Eleven minutes passed before Delaney Maxwell was pulled from the icy waters of a Maine lake by her best friend Decker Phillips. By then her heart had stopped beating. Her brain had stopped working. She was dead. And yet she somehow defied medical precedent to come back seemingly fine-despite the scans that showed significant brain damage. Everyone wants Delaney to be all right, but she knows she’s far from normal. Pulled by strange sensations she can’t control or explain, Delaney finds herself drawn to the dying. Is her altered brain now predicting death, or causing it? Review:- Seventeen year old Delaney Maxwell fell through the ice and was under the water for eleven minutes before her best friend Decker managed to save her life. After eleven long minutes, she should be dead. Surely no one could survive that long without oxygen, but she does. She is in a comma and awakes with no signs of injury, shocking doctors. However, she isn’t the same person she was before the accident. She has a sixth sense for when people are going to die. People around her think she is going crazy, she starts to think this herself. Then she meets Troy. A mysterious boy, who happens to have the same ability. I think Delaney is a great main character, you can relate to her, the way she is confused and scared by her new ability and what has happened to her. You can sympathise as you go through everything she is going through. Decker was one of my favourite characters in the book, being Delaney’s best friend since they were little, they are inseparable. So close, their feelings go way beyond friendship. But they would never admit it to begin with. Throughout the book, they slowly start to talk about their feelings. I am rooting for these to all the way. Troy, I am not so keen on, he is a creepy guy. This is a very impressive debut novel. I did enjoy this book, it was fast paced and gripping. But, I did feel the love story between Delaney and Decker was a little drawn out, having said that I was still rooting for them. It will make you think about how fragile life is and ask yourself what would you do if it was your last day. I am sad that is it a stand alone but look forward to the next Megan Miranda’s book. 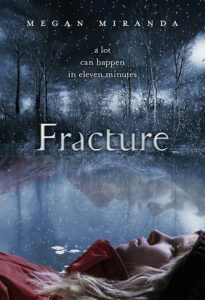 Fracture is a stand alone story but there is a free short story prequel called Eleven Minutes that can be downloaded from the Fracture Facebook page (read my review of Eleven Minutes here). Visit Megan Miranda’s website for more information. Disclaimer:- Received from Bloomsbury in exchange for an honest review.